How to Modify the Kawasaki ninja 150?? For Suspension, especially the front, on the materials used CBR 400. Although not the model upside down, but still looks good. Rear swing arm design that is curved, such as the banana. 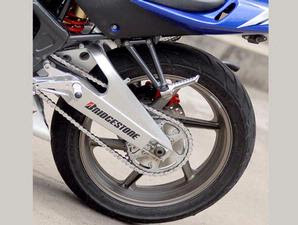 Wearing Suspension behind Honda CBR 400. Once tried to create the look back higher. 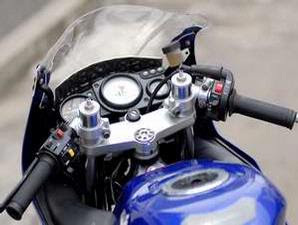 The solution, install the rear mono shock Ninja that position remains proportional. Done deal foot-feet, motor kawasaki ninja 150R is brought to the workshop Mosbi. Then establish a stern Honda CBR400 motor model with a separate seat. Not only that, the bottom of the fairing to cover the exhaust side with the use of fiberglass changed! Meanwhile, for spate board front does not have the CBR400 because the high price. 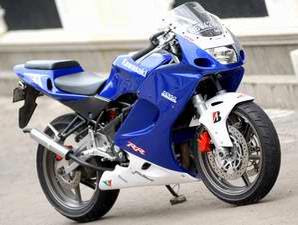 Color combination of blue and white very fit and strengthen the Kawasaki Ninja 150 look like a big Motorsport.